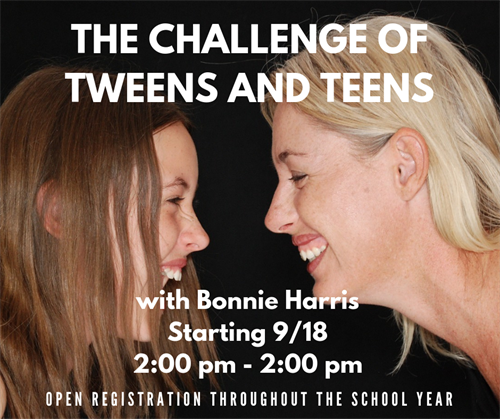 If you’re the parent of a tween or teen, you have lots of questions and concerns. This support group facilitated by parent educator, Bonnie Harris will give you the opportunity to share them and learn. You will hear from others in the same boat and find you are not alone. You will gain the knowledge you want about these developmental stages, what you should and should not expect, learn how a connective approach can maintain your relationship and influence, and laugh a lot. See our page describing our sliding fee scale for your weekly fee for this program that runs throughout the school year (we follow the ConVal School District calendar). Our programs are for everyone so please let us know if you have any questions before you register. To reserve your spot, choose one of the initial payments below, based on our sliding fee scale for the first week. You will be billed according to your chosen level for the remaining weeks at your first class. This program runs on weekly on Tuesdays, 12:00 PM to 2:00 PM. Join at any point during the school year. $20/week, but sliding fee scale applies.